In a mood of high optimism inspired by both the actual and prospective financial contributions of Washington C. DePauw, the reinvigorated and renamed university opened the 1884-85 academic year with elaborate - not to say grandiose - plans for an expanding educational program. A 308-page catalogue with a portrait of the benefactor himself on the front cover described them in detail. 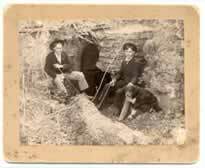 Despite brief experiments with attached law and medical schools, Indiana Asbury had been a university in name only. The new DePauw University sought to become a genuine university offering graduate and professional instruction in several fields, in addition to undergraduate and preparatory work. Perpetuating the memory of the man for whom the institution was originally named was the Asbury College of Liberal Arts with its four divisions: the Classical Course, Philosophical Course, Scientific Course, and a new Course in Literature and Art, each with its own curriculum and baccalaureate degree. The ambitious new scheme of organization included separate schools for the three learned professions - law, medicine, and the ministry - along with special schools for music, art, pedagogy, horticulture and "mechanical industries." The School of Military Science and Tactics was also listed in the catalogue among the latter, but was in actuality simply the program of military training required of all underclassmen since 1876. Rounding out the organizational structure was the Greencastle Preparatory School, which continued the work of the preparatory department dating back to the founding of the university. This expansive vision of a revitalized university called for a new physical plant and a more spacious campus. Citizens of Greencastle and Putnam County had already met one of Washington C. DePauw's conditions for his benefactions by raising funds to purchase large pieces of property adjacent to the old Asbury campus. DePauw himself provided the purchase price for the 120-acre Jacob Durham farm located on the northeast edge of the city, which was visualized as the potential site for an ideal campus of the future. These enlarged grounds were often described as being composed of five "parks" as follows: West Park, a grove of trees where the old Edifice, rebuilt after the 1879 fire and renamed West College, was located; Center Park, a freshly landscaped area surrounding recently completed East College; East Park, a somewhat smaller plot bounded on the north by Anderson and south by Hanna Street and containing the Locust Street Methodist Church and the university-owned home of former president Matthew Simpson; South Park, several acres of land stretching south of Hanna Street, where the most notable structure was Professor William Larrabee's former home and garden known as "Rosabower"; and finally University Park, the huge tract of rolling farmland almost a mile from the main campus with only the Durham home and some outbuildings near its western end. 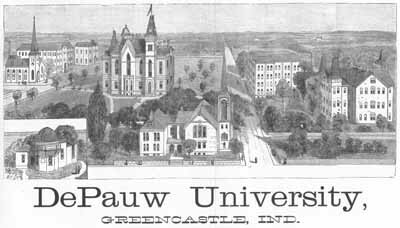 As chief donor and president of the board of trustees, W.C. DePauw took a personal interest in the planning and construction of additional physical plant to house the enlarged university. He spent considerable time on the scene in Greencastle helping to direct the work. Of the five structures originally planned by the trustees' building committee chaired by DePauw, four were actually erected, and extensive additions were made to West College, including an annex to provide more space for the library. The supervising architect for all this construction was Joseph Marshall, whose designs were plain and utilitarian. 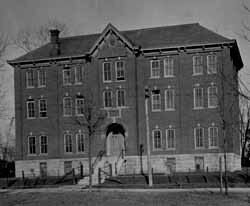 The first building to be ready for occupancy was Ladies' Hall, a three-story dormitory located in East Park on the present site of Mason Hall. It contained rooms for 80 women, a large reception hall, and dining facilities for 250 students of both sexes. This represented a striking innovation for an institution that had never before assumed responsibility for housing students. It was partly inspired by DePauw's recent European tour, during which he observed with interest the residential colleges of British universities. Across campus in West Park on the present site of Harrison Hall was erected Gentlemen's Hall, a somewhat larger, four-story structure of otherwise identical design. It was built on a field that had been used by students for baseball games. Small outbuildings with tall smokestacks located in the rear of each dormitory furnished steam heat, the first central heating system on the campus.